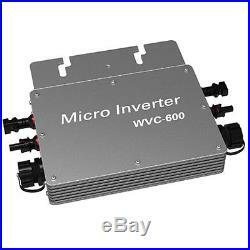 WVC600 Series Micro Inverter. Using IP65 waterproof streamline design, Can effectively prevent rainwater on the surface erosion. Built-in high-performance Maximum Power Point Tracking(MPPT)Function, Better able to track changes in the solar luminosity and control different output power. Effectively capture and collect sunlight. AC electric power transmission using the reverse transmission technology, Is one of our patented technology. The inverter output power can provide load priority use, Extra electricity to the grid, Efficient use of the inverter to the power emitted, Electricity transmission rate of up to 99%. Pure Sine Wave Output. High performance Maximum Power Point Tracking(MPPT). Power Automatically Locked(APL). High-Frequency High Conversion Rate. Input /output is fully isolated to protect the electrical safety. Smaller Size & Lighter Weight. The Leading Patent Technology. Simplify maintenance (user serviceable). Installation and maintenance costs low. High Efficiency & Best Cost-Effectiveness. Intelligent MPPT & Weak Light Tracking Algorithm. Met The Grid Products Certification Standard. Recommend the use of PV modules. Maximum input DC voltage. Peak power tracking voltage. Min / Max start voltage. Your solar panels’ output voltage in series or in parallel. Should be in this range. Maximum DC short current. Your solar panels’ output current in series or in parallel. Should be less this value. Maximum units per branch circuit. Night time power consumption. Operating temperature range (inverter inside). Reverse transfer, load priority. DIN VDE 1026 UL1741. CEC, CE National patent technology. System Block Diagram & Application. In order to achieve higher power, we can use this inverter in stack. 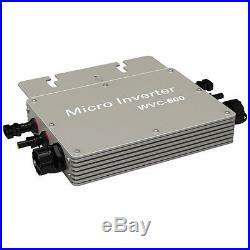 For example: 10 pcs of WVC600 grid tie inverter used in stack can achieve 6000W. And the stacking number is unlimited. Easy Installation & Multiple Stacking. Single-Phase & Three-Phase Electrical Schematics. Please install the inverters according to the user manual and connnet the groud safety. Forbid openning the shell with non-professional person , only qualified maintenance person can repair the product. The inverter should be installed in the low humidity and well ventilated place, and remove the flammable things surrounding the inverter for avoiding overheating. Avoid children play when the inverter is working. Ensure the DC input and AC output when connect with PV. The Vmp and Voc of PV should be fuit for the prodcut for get output max. All inverter must secure connection ground wire. The item “22-50VDC to 230VAC 600W Grid Tie Micro Inverter with Power Line Communication” is in sale since Monday, August 01, 2016. This item is in the category “Home & Garden\Home Improvement\Electrical & Solar\Alternative & Solar Energy\Chargers & Inverters”. The seller is “zcsolar2016″ and is located in , . This item can be shipped worldwide.